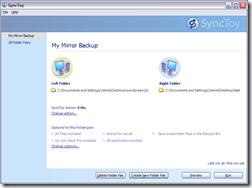 One of the best ways to backup your documents and files is to perform a mirror backup. 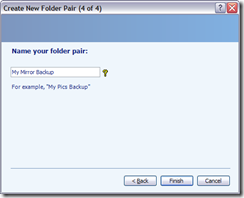 As I have mentioned before in 20 Pointers for planning your backup strategy. 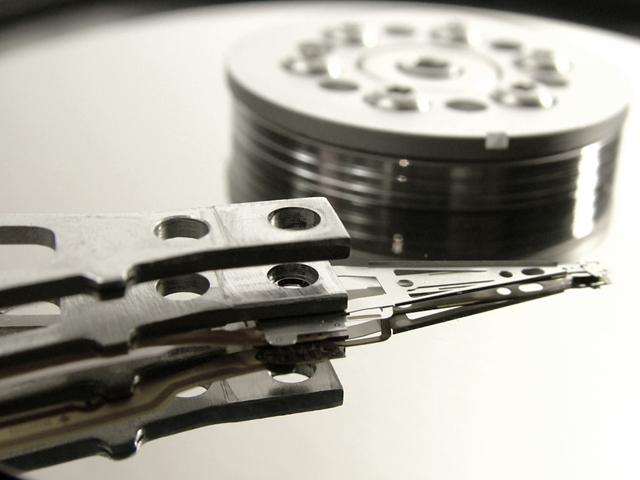 The simplest backup strategy can often be the most effective one. 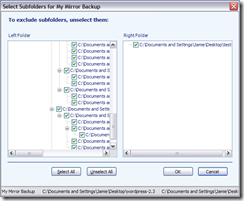 A Mirror backup simply consists taking a complete copy of documents and files and storing them in alternative location. 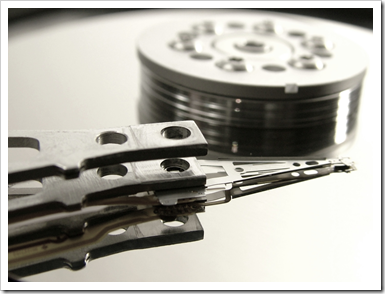 Unlike a traditional backup, the files are not compressed or encrypted. 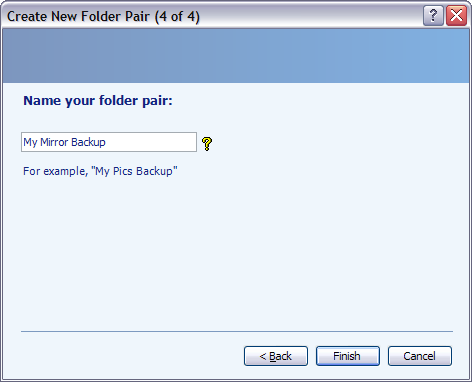 Restoring the backup is either a simple process copying files back or pointing users to the mirrored location. 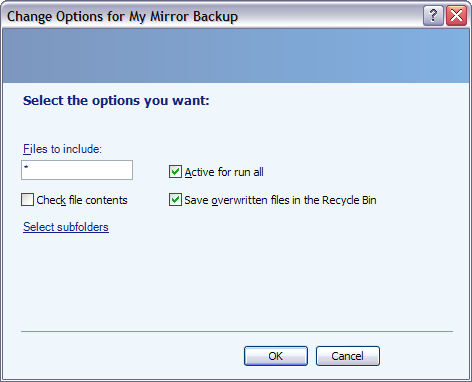 Mirror backups are a great addition to your primary backup solution and effective way to restoring files quickly. 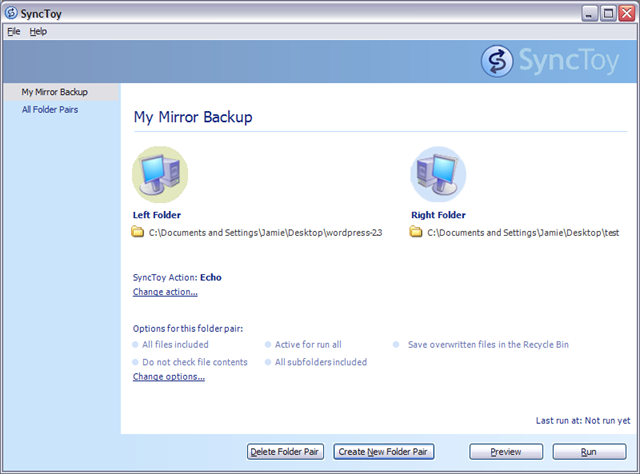 To perform a Mirror backup you can simply copy files and directories yourself to backup location. 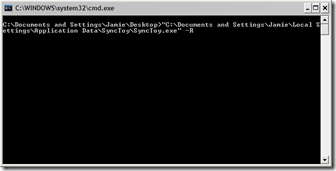 You can automate the process by writing a batch file and schedule the task using Windows Scheduler. Although, Windows has a couple of issues when it comes to copying large amounts of files. 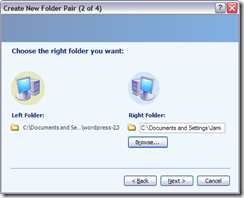 Often Windows will halt the copy process if it encounters an error with just one file. Another bug bear is when a the process stops to ask the user if they would like to over write existing files. This is fine when copying small amounts of data, but a real pain when you leave Windows to copying large amounts of data that may take a number of hours. Combine: New and updated files are copied both ways. Nothing happens to renamed and deleted files.In this example, we are going to create a solution that would allow a user to automatically backup files to a location over the network simply by running a shortcut on the desktop. 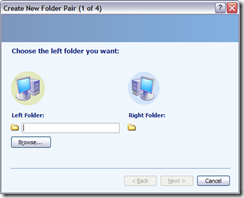 The Left Folder is where the originally data is held, the documents and files you wish to backup. 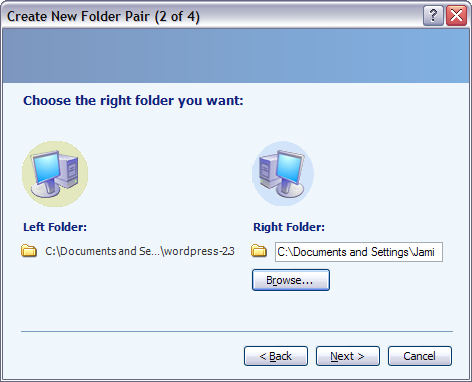 Browse to the top level directory that contains these files and click on Next. 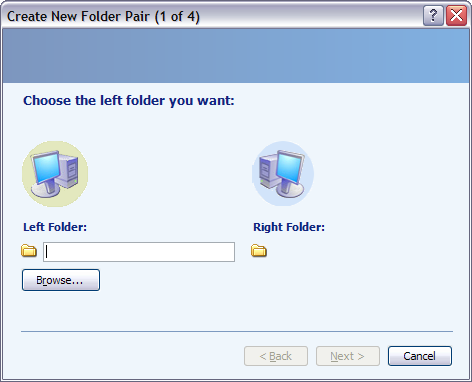 The Right Folder is where you would like the data backed up to. This can be a mapped network drives, UNC path (\\server\folder\) or simply a local location on the same machine. 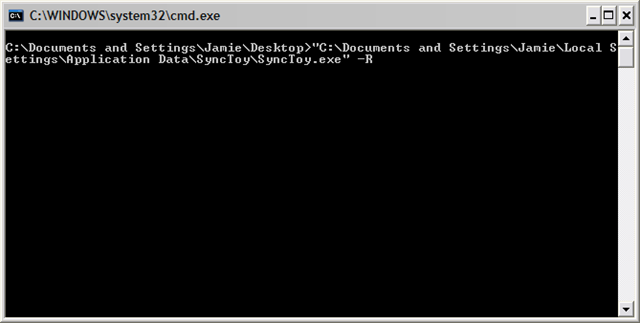 Next the tricky part, deciding on how SyncToy should copy the data. We are going to choose Echo, which is basically a one way. This saves on time and bandwidth by only copying new and updated files. Click on Next. 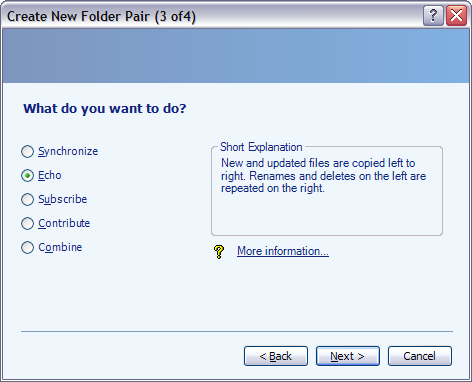 Give your backup job a name and click on Finish. 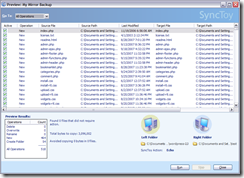 Check file contents – You might want SyncToy to check the contents of the file rather than relying file size and date attributes. 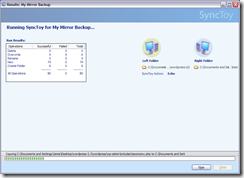 Active for run all – SyncToy can have a number of backup jobs which can be run as a set. Un-ticking this means that this backup job won’t be included in a batch run. 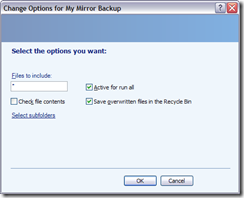 Save overwritten files in the Recycle Bin – Any files that are overwritten are saved in the recycled bin. 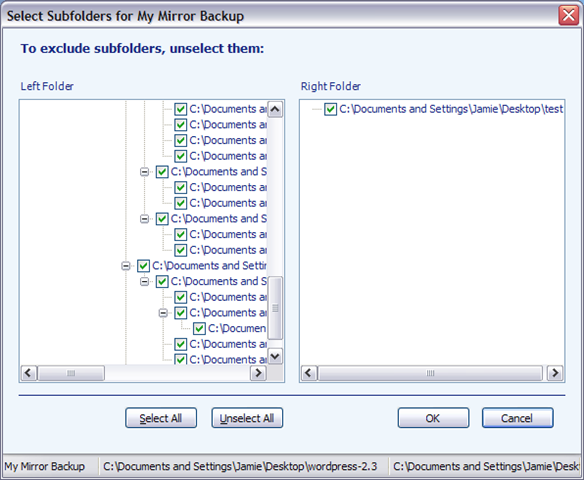 You can choose which individual sub folders are included in backup job by clicking on Select subfolders. When your finished with additional options, click on ok and return to the overview screen. 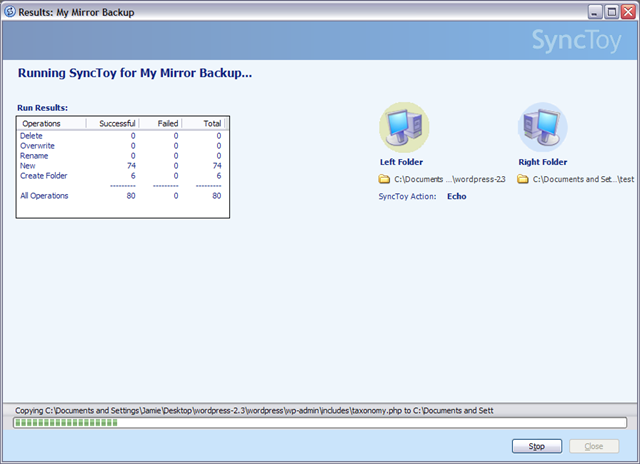 Next click on Preview button and SyncToy will give overview of what will happen when the backup job actually runs. If your happy with the results, click on Run and the backup job will run for real this time. That’s it! As this backup job is going to be run by the user, we want to make the process as simple as possible. 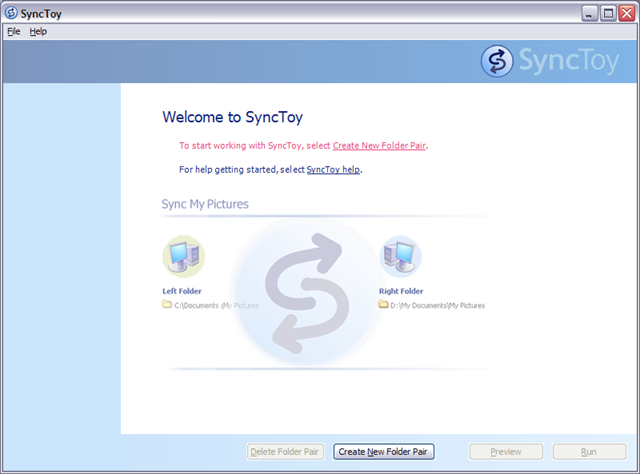 SyncToy has nice feature that allows it to run in batch mode by using -R switch. 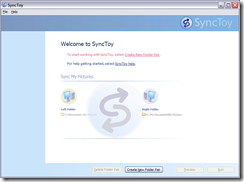 Open notepad and add the follow line “C:\Documents and Settings\<your username>\Local Settings\Application Data\SyncToy\SyncToy.exe” -R.
You might need to double check the location of the SyncToy.exe as this varies depending on the version of Windows. 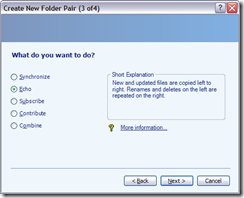 Save the file with a .bat extension to the desktop. 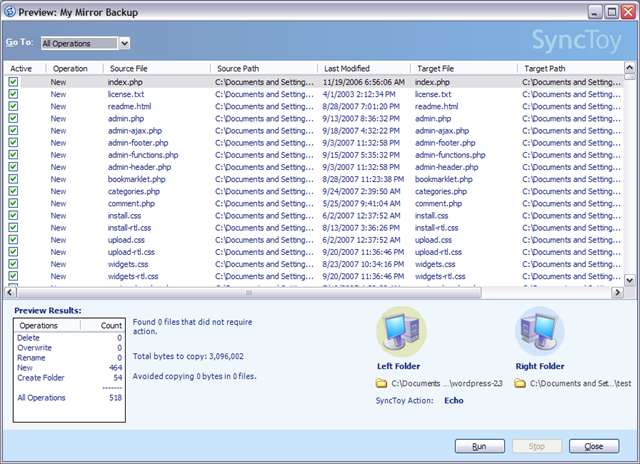 Now the user can simply double click on the batch file and SyncToy will complete backup jobs that have been defined. Alternatively you can have Windows Task Schedule (Found in the control panel) run the batch so the whole process becomes automated.